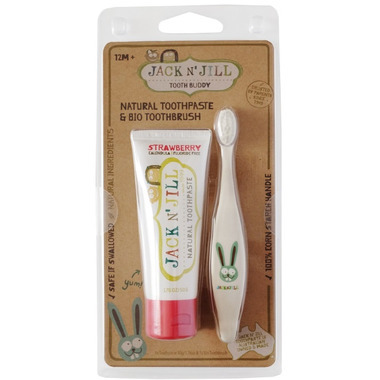 This Jack N' Jill Bio Toothbrush has a compostable & biodegradable handle. It has rounded nylon bristles for superior cleaning and is make from 100 % non GMO corn starch. This natural toothpaste has organic calendula to soothe gums, is rich in Xylitol, and has an organic natural strawberry flavour. It is also safe to swallow! Ingredients: Xlitol, purified water, vegetable glycerin, silica, organic natural fruit flavour, xanthum gum, organic calendula officinallis extract.